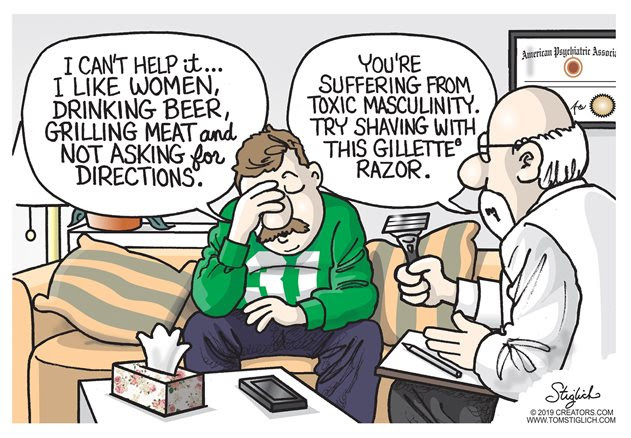 Exclusive: Meet the CEO Who Put His Company on the Line to Stand Up to Gillette’s ‘Toxic Masculinity’ Ad. Should we surrender to the confusion and homogenization of boys to girls and men to women? Nope, we won’t be cowed and demeaned. For the most part we’re happy in our skins and we’ll always be just men. Mind Bending Finale’ … LGBTQIA is sometimes used and adds “queer, intersex, and asexual” to the basic term. … There is also the acronym QUILTBAG (queer and questioning, intersex, lesbian, transgender and two-spirit, bisexual, asexual and ally, and gay and genderqueer).